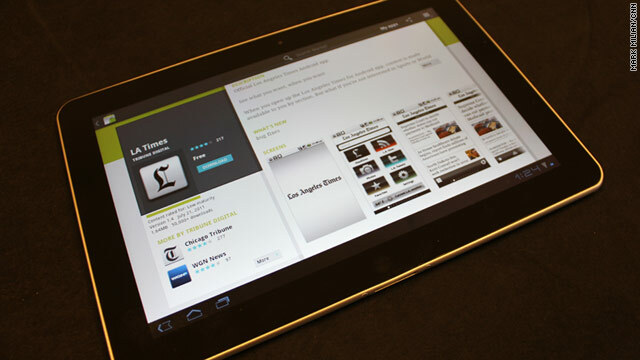 The Los Angeles Times' app is available for download in the Android market, seen here on the Samsung Galaxy Tab 10.1. (CNN) -- Hoping to take a small slice from Apple's big pie, newspaper publishers are developing tablet computers of their own. The Tribune Co., one of the largest U.S. news enterprises, is working on a touchscreen tablet that it plans to offer to newspaper subscribers, according to people briefed on the plans. The Chicago company owns a handful of major daily newspapers, including the Chicago Tribune and The Baltimore Sun, along with 23 television stations. Tribune also owns the Los Angeles Times, which is my former employer. The tablet is expected to run a modified version of Google's Android operating system and prominently feature software for the owner's hometown newspaper, according to interviews with more than half a dozen current and former Tribune employees. They requested anonymity for fear of losing their jobs or of souring relations with a former employer. Tribune aims to offer the tablet for free, or at a highly subsidized price, to people who agree to sign up for extended subscriptions to one of its papers and possibly a wireless-data plan with a partner cellular carrier, said five people briefed on the project. The initiative, a major one for the national media company hoping to emerge soon from bankruptcy, spans several cities and includes various consultants and partner organizations, the people said. Tribune has been in discussions with Samsung Electronics and others to build the hardware, three people said. Spokesmen for Tribune and Samsung Mobile declined to comment. The project has proved to be a more complicated undertaking than expected. Tribune had set a mid-August deadline to begin testing the tablet in Chicago and Southern California, but it will miss that target, said three of the people. "They're having to reinvent many wheels," said a person familiar with the matter. "If it turns out to be a failure, it'll be a fantastically interesting failure." Tribune's major newspapers currently offer free applications for the major smartphone platforms and on Apple's iPad. The company also has a multimedia program, called Mosaic, for Windows tablets and phones as well as for Samsung's Galaxy Tab, which is based on Android. However, Tribune's newspapers don't have apps optimized for the new breed of Android tablets, which run a version called Honeycomb. The tablet project is getting deep technical resources and attention from Tribune's highest ranks, said five of the people familiar with its development. Meanwhile, the company has recently restructured its media services and publishing facilities, laid off editorial staff and is continuing to plead its case in bankruptcy court. Eddy Hartenstein, Tribune's chief executive, is the tablet's biggest advocate, personally briefing people on his vision for the product, said four people familiar with the matter. He's a longtime technologist, having founded DirecTV. Hartenstein also sits on the boards of Sirius XM Radio, data-storage provider SanDisk and semiconductor giant Broadcom. "It's Eddy's baby," said one person familiar with the plans. Hartenstein, also the publisher and CEO of the Los Angeles Times, was a member of Tribune's recently dissolved four-person executive council installed after the resignation of Randy Michaels last fall. Last month, Hartenstein appointed Tony Hunter, another member of that council, as chief of Tribune's publishing division, saying that Hunter "understands the importance of our digital efforts, and how critical they are to the success of our publishing group." Hartenstein declined to be interviewed for this article. Employees and executives who spoke on the condition of anonymity were split on their optimism for the project. "I would be shocked if it was successful," one person said. But many media analysts say the economics of digital publishing on subsidized tablets appears to be sound given the expense of printing newspapers, especially with ever-rising ink prices. But that's if the advertising revenues from digital platforms can match those on paper, which has not been the case so far. At least one smaller newspaper publisher has heeded this advice and is making a similar bet. The Philadelphia Media Network announced last month that it plans to sell deeply discounted Android tablets bundled with software that will display digital versions of its Inquirer and Daily News newspapers. The company plans to begin a trial program by selling 2,000 tablets early next month, with more to come by the end of the year, said spokesman Mark Block. The tablets from each are expected to function like other, similar consumer devices, meaning that users can freely download other apps, play games and surf the Web. Thanks largely to Apple, interest in tablets has exploded in the last year. But only 8% of American adults own one, according to a recent Pew Research study. That leaves a potential opening in the market for new players, especially those that can undercut the upfront cost of the devices.